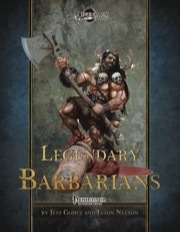 Dozens of alternate class features allow a piece-by-piece construction of your perfect barbarian, while 11 new archetypes (such as the mutagenic rager, slavering nightmare, and righteous berserker) tie your abilities together in a theme, like the savage that trades rage for a more stoic approach and the fury that just can't stop raging! All this, plus tons of new feats like Wield Halfling, magic items like the totemic club, barbarian brands, sample character builds, and more, including a ready-to-use legendary barbarian, Gorund Wildwalker! Grab this amazing 42-page Pathfinder Roleplaying Game class supplement by Jeff Gomez and Jason Nelson and Make Your Game Legendary! Woohoo! Time to walk on the WILD side! Can I use Wield Halfling for Gnomes as well or is it specifically for Halflings? Author Jeff Gomez just dialed up his next assignment, going from Barbs to Bards! Legendary Bards - the game is afoot!